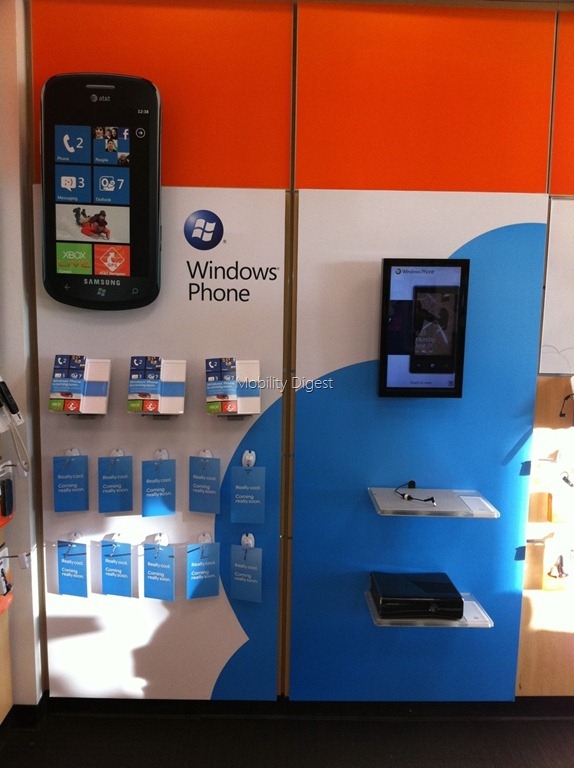 The US launch of Windows Phone 7 is on Monday, and AT&T stores around the country are gearing up for the release. The display seems to showcase not only the operating system, but the Xbox 360 as well. This is great since one of Microsoft's strengths is the strong ecosystem. Only one more day until users around the country find out for themselves! Heh, unlike the Zune, MS is at least launching it in other places first before the US. I've yet to play with one though! Guyz the wp7 os is great. I've bought a mozart its a great phone. I cant wait till you guyz in the Great USA/north america (i'm in the Australia) get the phone. So more great apps come out. The only thing i come to relize is the lack of space. I've only 3 gbs left . I need more space. I guess that first gen phone is . Oh wellz .I'm excited for you guyz. I picked a Samsung Focus up today. We'll see how it goes. Believing that the universe spontaneously generated, developed self-governing laws and produced intelligent life all by random, material events requires greater faith than I am able to muster. I'm a T-Mobile user and I have chose to go with the Dell Venue, so it looks like I have another week before I can order my new Windows Phone. The anticipation is killing me! I need my new technology now!